Very Very Vicky: Building A House Upon The Sand--Wise or Foolish? There's a parable that speaks of the wisdom of building your house upon a rock and the foolishness of building your house upon the shifting sands. With that in mind, it is time to see how we are anchoring our house firmly in place--at the beach you can't avoid the sandy foundation, so what gives? This is the sight that greeted me one day when driving over to check on my house....There were plumblines hanging from every corner as well as many others hanging at different intervals all over the underside of the house. Squares were drawn with spray paint under each plumbline. Deep holes were dug in each of those orange squares. There was a grid of holes all over the ground beneath the plumblines. 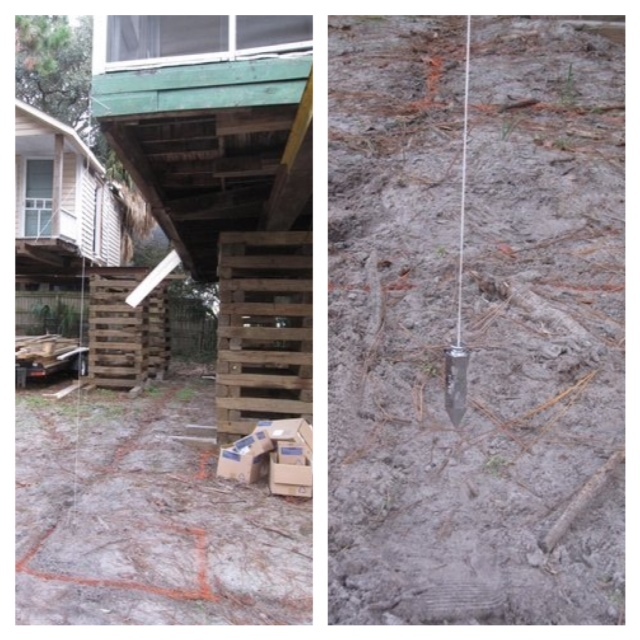 Our contractor, Anthony Sapone, explained the next step to me...rebar would be placed in the holes along with cement.